Bizen Osafune Motoshige (備前長船元重) is generally thought to be the son of Morishige (守重) of the Hatakeda School (畠田系). Other texts, however, say that he is the son of Morizane (守真) of the Hatakeda School (畠田系). The earliest dated work of Motoshige (元重) gives a date of Showa (正和) at the end of the Kamakura period. The latest date known is in Jôji (貞治) (1360’s) in the middle of the Nanbokuchô period. This would give him a working span of more than fifty years. This has caused great speculation as to whether or not there were actually two generations of smiths by this name. 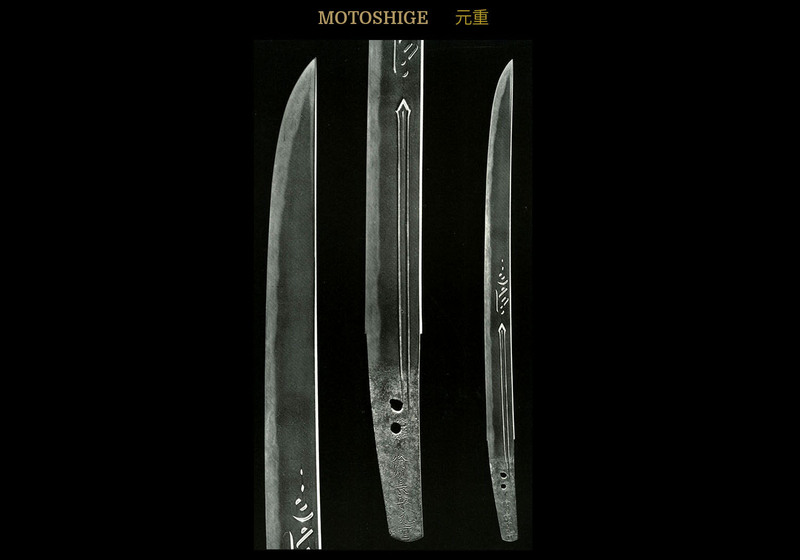 The earlier blades by Motoshige (元重) are done in true Kamakura period style that is of a slender sugata with suguba of tight nioi with ashi iri bearing a resemblance to the works of the Aoe (青江) and Yamashiro (山城) smiths. Additionally, the signatures are always done in niji mei (two character) with the size of the mei being rather large. The later works from the time around the Kanô (観応) era are signed with a much smaller signature. We should keep in mind, however, the changes in the overall style of swords between the Kamakura and Nanbokuchô periods; not forgetting that the works of smiths who spanned both periods would naturally change to meet the demands of the changing times. Additionally, the signature becoming smaller could naturally be accounted for by the decrease in the width of the shinogi-haba which took place in the Nanbokuchô period. As Fujishiro Matsuo pointed out, signing a tachi-mei necessarily entailed fitting it between the shinogi ridge and the mune, thus the size of the mei had to be determined by the width of the shinogi haba. The fact that Motoshige’s (元重) mei on tanto and hira-zukuri wakizashi remained unchanged which seems to verify this line of reasoning of one smith. Feeding fuel to this fire of the common conception of two generations is that the second generation Motoshige (元重) was historically considered to be one of the three great students of Sadamune (貞宗). 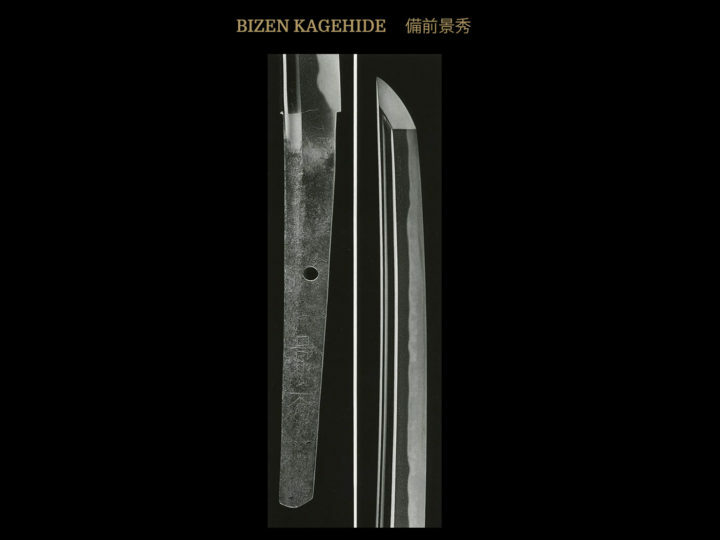 This resulted in a number of his works being done in the Bizen-Soden style. Subscribers to this two-generation theory refer to the first Motoshige (元重) as Ko-Motoshige (古元重) and the second generation as Motoshige (元重). However this controversy turns out, there is agreement that the works of Motoshige (元重) are of the highest quality and he is credited with founding the Motoshige (元重) School of Bizen Den. Smiths of the Motoshige (元重) School include Shigezane (重真) and Motozane (元真). Hereafter in this paper, we will refer to Motoshige (元重) as being the smith whom most consider to be the second generation smith by this name. 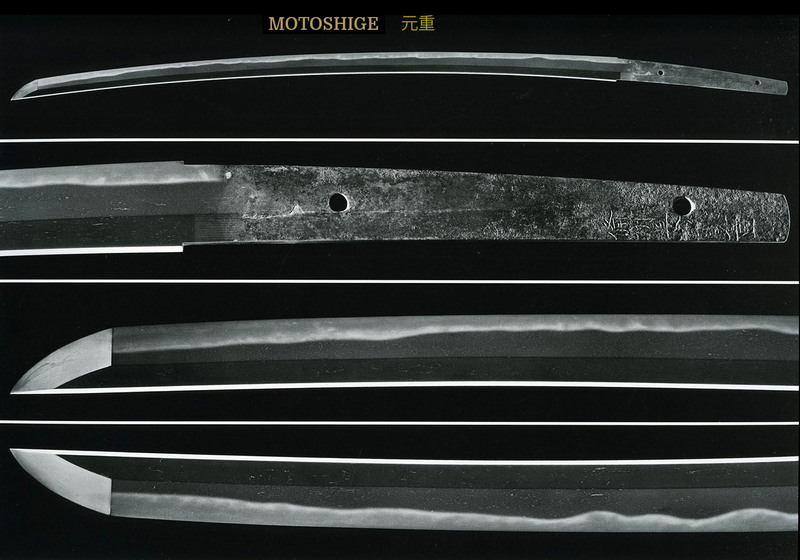 SUGATA: Since there is no doubt that this smith spanned both the end of the Kamakura period and well into the Nanbokuchô period, we find two distinct shapes to his blades. Early blades have the graceful slenderness of the Kamakura period while later blades are done in true Nanbokuchô sugata. 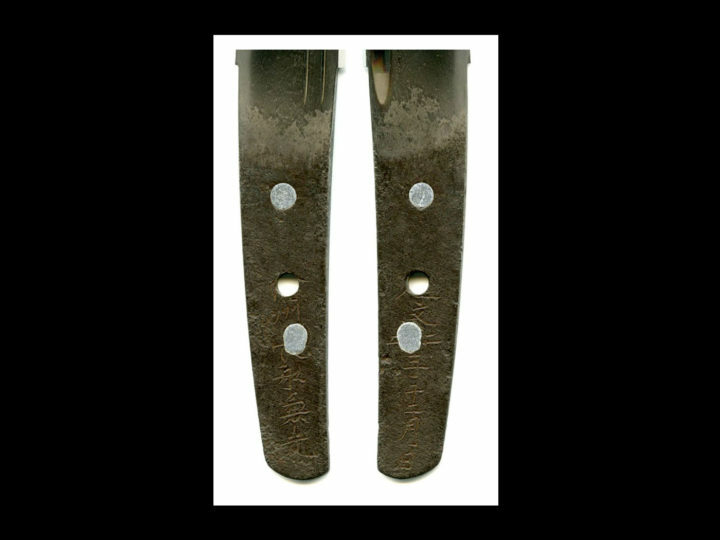 That is, the later blades are long, wide and have extended and often very large kissaki. Tachi are most common and they have koshi-zori with a wide mihaba and a high shinogi. Wakizashi tend to be hira-zukuri. Tantô are rare and the style varies between hira-zukuri ones with a wide mihaba, sun-nobi length, and saki-zori; and those that are mu-sori and small. JITETSU: The kitae is itame mixed with mokume. Occasionally we will find masa-gokoro where the itame mixes with masame. Dark spots or jifu will also be found. Midare utsuri will be found. HAMON: The hamon will be nioi based, as is the case with Bizen works. It will consist of square shaped kaku-gunome and kataochi-gunome mixed in with the suguha. 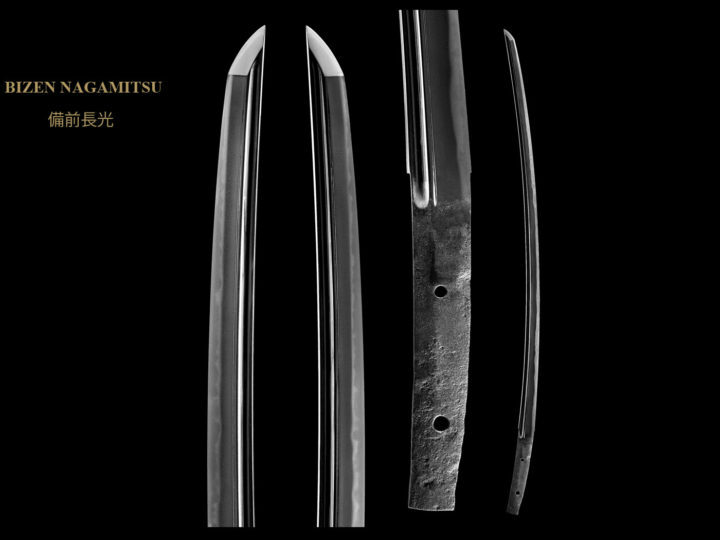 One of the important kantei points of this smith is that the inner outline (tops) of the midare hamon will make a seemingly straight line. 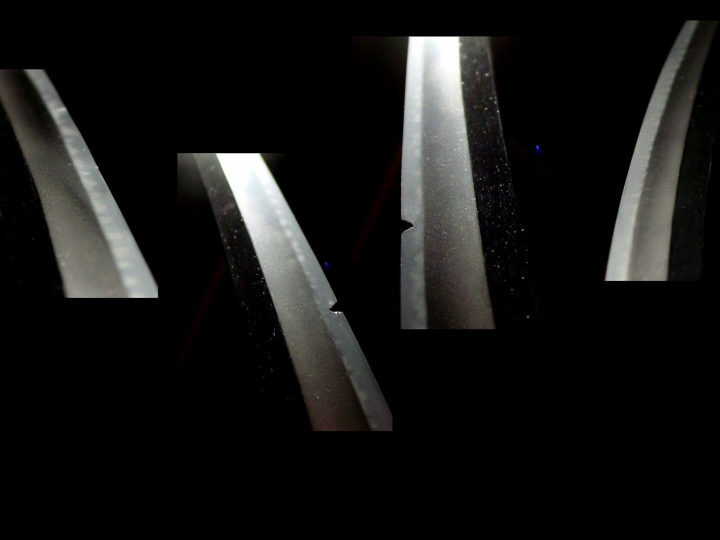 Further the hamon is mixed with more compact midare patterns than the works of Kagemitsu (景光) or Kanemitsu (兼光). Kinsuji will be seen as well as ashi, yô and sunagashi. BÔSHI: Motoshige’s (元重) bôshi is also unique. It will undulate modestly forming a ko-maru shape with a short kaeri at the tip and give the semblance of a sansaku type of bôshi. His average bôshi has a pointed tip with kaeri. NAKAGO: The tip of the nakago will be kurijiri and the yasurimei will be katte-sagari or sujikai. HORIMONO: Bô-hi and futatsu-hi on tachi and suken and bonji on ko-wakizashi are seen.